I have almost no recollection of Super Bowl XXIX — and not just because the Super Bowl was terrible. It was January 1995, I was a junior in high school, and my debate team was busy preparing for the state finals. We had the game on in the background somewhere but between cutting cards and practicing our 2NRs, we weren’t paying much attention. But we didn’t miss much. The San Francisco 49ers, 19-point betting favorites, scored on the fourth play of the game when Steve Young tossed a 44-yard touchdown to Jerry Rice. They never looked back and beat the San Diego Chargers 49-26. It was, by one measure, the least exciting Super Bowl in history. If you were a teenager in the 1990s, the Super Bowl had been terrible for as long as you could remember. From Super Bowl XIX in 1985 (the first one I remember watching — the 49ers crushed the Dolphins 38-16) through Super Bowl XXIX, the average margin of victory was 22 points. The betting public undoubtedly noticed this too, which may have been why the point spread for the Super Bowl was often extremely large. The point spread for Super Bowl XXIX — 19 points — looks absolutely crazy in retrospect. You almost never see a line that wide in the NFL. Since 19781, only 14 other NFL games (regular season or postseason) have featured a spread that large. It happens about once every third season, and usually requires the absolute best team in the league to be playing the absolute worst one. This time it happened in the Super Bowl. But it seemed perfectly sensible at the time. Between Super Bowl V — the first one after the AFL-NFL merger in 1970 — and that 49ers-Chargers blowout in Super Bowl XXIX, the betting favorite covered the spread 18 of 25 times. Could this just have been random? Maybe, but an 18-7 record can’t be dismissed out of hand: If you flip a fair coin 25 times, the probability of coming up with heads 18 or more times is just 2.2 percent. 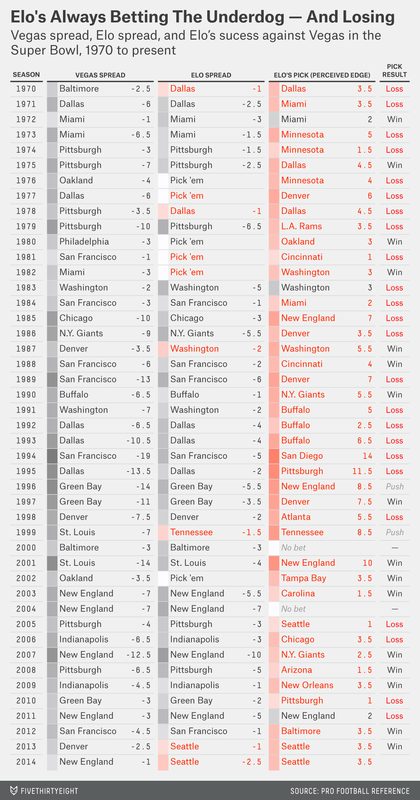 We can show how handicappers were treating the Super Bowl differently through FiveThirtyEight’s Elo ratings, which we’ve run retroactively back to 1970. The Elo ratings are a simple formula — they account for only wins and losses, margin of victory, home field advantage and strength of schedule — but they usually match Vegas point spreads pretty well. While they can disagree with Vegas on the strength of particular teams, they aren’t routinely recommending that you bet on underdogs instead of favorites, for instance. 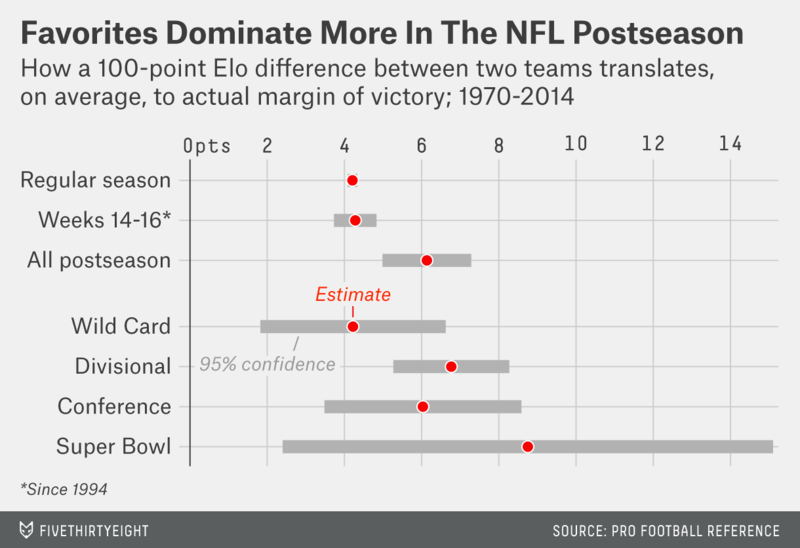 But in Super Bowls, Elo-generated point spreads have been systematically different from Vegas lines. In Super Bowls since 1970, Elo would have recommended a bet on the Super underdog 40 times — and the favorite just three times. Because these underdogs were getting crushed up through the mid-1990s, Elo’s betting strategy would be getting crushed too. Its record up through and including Super Bowl XXIX — when it would have had the Chargers as only 5-point underdogs instead of 19-point ones — would be just 7-18. So maybe Super Bowl betting strategy is simple? Bet on the favorite, stupid. Except, maybe not. You can probably guess what’s happened since 1995. In the 19 Super Bowls since that time, underdogs have been on a tear, having gone 12-5-2 against the point spread. On average, underdogs have beaten the point spread by more than 6 points during this period. Lately, they’ve won quite a few games outright too, including each of the last three Super Bowls and five of the last seven. Here’s one chart that summarizes this history. It compares the Vegas point spread (in light grey), the Elo point spread2 (in dark grey) and the actual result (in red), using a polynomial smoother to more clearly show the long-term trends. In the chart, you can see how favorites outperform Vegas point spreads in Super Bowls throughout the 1970s and 1980s. But Vegas is trying to catch up and keeps listing wider and wider point spreads for the games. (These increasingly wide point spreads are not justified according to Elo, which don’t see the Super Bowls of the era as featuring especially lopsided matchups.) 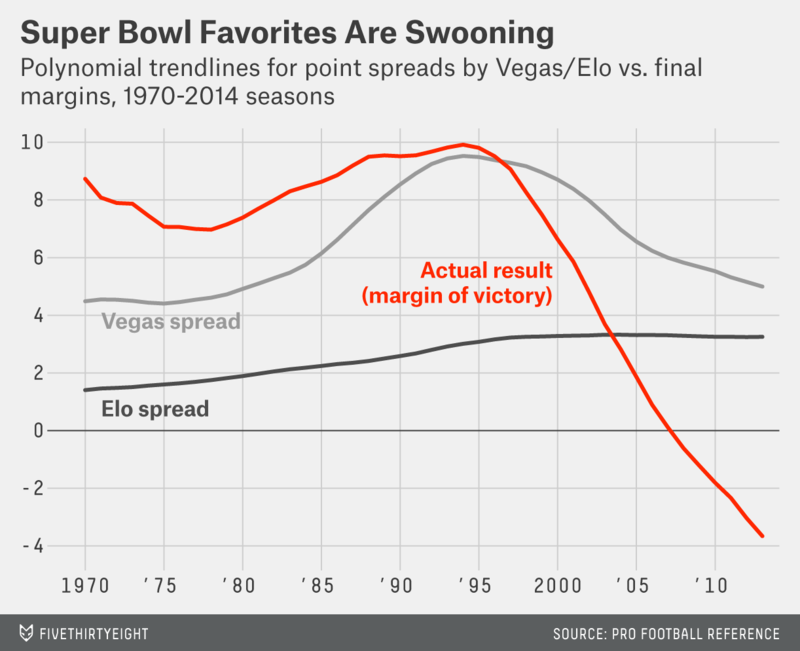 By the mid-1990s, Vegas has fully caught up to the historical tendency of favorites to perform well in the Super Bowl. Right about at that time, however, underdogs go on a run instead. From Elo’s point of view, these point spreads became wide enough to seem almost irrational. On average for Super Bowls played in the 1990s, Elo would have expected to win a bet placed on the underdog 70 percent of the time.4 That’s a huge edge: even the best sports bettors in the world struggle to win more than 55 percent of the time. But we should be careful about asserting that bookmakers and the betting public were just being foolish. Indeed, pretty much any time you claim to have a 70 percent edge against Vegas, you’re the one who’s being foolish. (This holds especially true given Elo’s record against Vegas in Super Bowls: Just 16-24-2 overall, although better in recent years.)5. So don’t be so quick to lay down a bet on the Seahawks, whom Elo has favored this year. They’re played after a two-week break, allowing more time for recovery from injury and fatigue. They also feature a much longer halftime, further reducing the effect of fatigue. They’re played at neutral sites, and almost always in warm-weather cities or in domes. They’re theoretically officiated by the best referees. They’re the last game of the season, so a team has no reason to leave anything on the table. Teams may be more inclined to run up the score. They’re the culmination of an elimination tournament. Both teams will go into the Super Bowl “hot” by virtue of having won earlier in the playoffs to get there. They’re contested between teams from different conferences, who are less likely to have played one another recently. They’re spectacular events. Perhaps only the World Cup and Champions’ League Finals and the Summer Olympics draw more worldwide spectator interest. Some of these factors, especially the first four, might help favorites by reducing the amount of luck in the game. Even great teams have trouble avoiding bad breaks from injuries, poor field conditions, or poor officiating decisions. But the impact of each of these factors is reduced in the Super Bowl. There’s also some evidence that favorites perform well in the playoff games leading up to the Super Bowl. In the chart below, I’ve run a regression on NFL games since 1970, where the independent variable is the difference in Elo rating between the teams (accounting for home-field advantage) and the dependent variable is the margin of victory or defeat. In the regular season, a team with a 100-point Elo advantage has won by about 4 points on average. (This edge is fairly consistent throughout the regular season; it doesn’t become larger in the final weeks of the year.6) In the postseason, however, the same 100-point Elo advantage has translated to more like a 6-point margin of victory. The difference is statistically significant. So perhaps those Super Bowl betting lines got a little bit carried away in the 1990s. No matter how mediocre the 1994 Chargers were, they probably shouldn’t have been 19-point underdogs to anyone. But postseason games differ from regular season games — and Super Bowls differ from regular playoff games. Even in the era of “Moneyball,” the postseason is an understudied topic — and stat geeks shouldn’t be so quick to dismiss what happens in the Super Bowl as luck. Are sportsbooks actually trying to split the betting action 50-50? Some people take this for granted, but it depends on the sportsbook and the circumstances — sometimes they’ll try to get the majority of the public on the wrong side of the bet. This is calculated assuming that Elo point spreads have a root-mean-square error (RMSE) of 13.5 points. They also have a higher RMSE: 16.8 points rather than 15.9 points for Vegas lines. Both systems have performed poorly in the Super Bowl as compared with the regular season, when the have an RMSE of about 13.5 points instead. In regular season Weeks 14 through 16 — I ignore Week 17 since teams sometimes rest their starters — a 100-point Elo rating advantage has historically translated to a 4.3-point margin of victory, versus 4.2 points for the regular season overall.